"Nature Boy" Ric Flair is my favorite wrestler of all-time. When I first started watching in the mid-1980s, Slick Ric was the guy I loved to hate. By the time he came to WWF in 1991 and I was in college, I was a full-time Ric Flair mark. He could do no wrong in my eyes and my fandom has remained strong since. I'm going to attempt to boil down his 40+ years in the business to a handful of great memories. (Automatic honorable mention is his Hall of Fame inductions). Flair's greatest moment came in 1992 when he won the Royal Rumble. 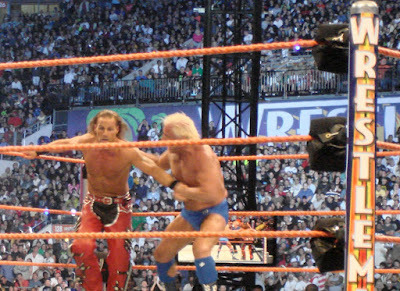 Not only did he set a record up to that point as being in the match the longest, Flair also won his first WWF championship. Not since Buddy Rogers had a wrestler held both the NWA and WWF World titles. His first run with the company was short lived, but one of the most action packed of anyone before or since. He had some great matches with Roddy Piper, Randy Savage and Curt Hennig before heading back south. Because I'd always preferred WWF to any other company (besides World Class) having Flair was the biggest coup of all time. 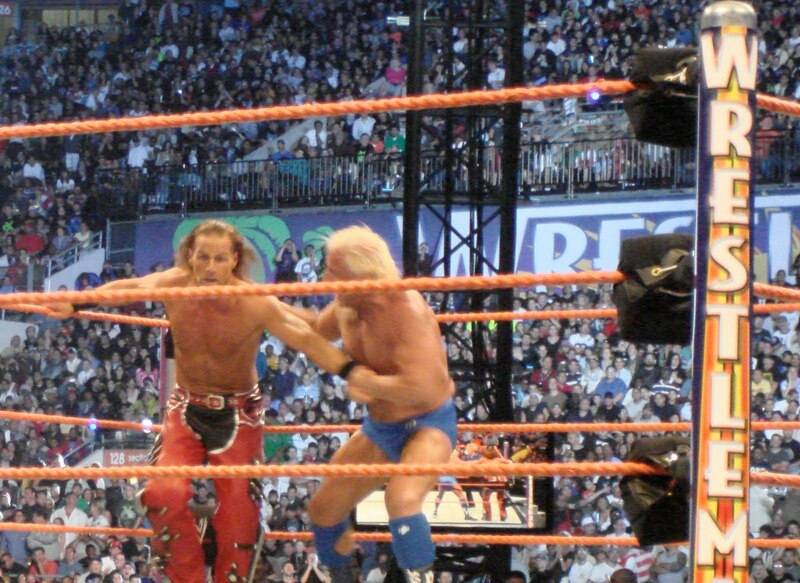 Sixteen years later Flair would wrestle in a WWE ring for the last time. He battled Shawn Michaels in my favorite WrestleMania match I've seen live. There was so much emotion involved. 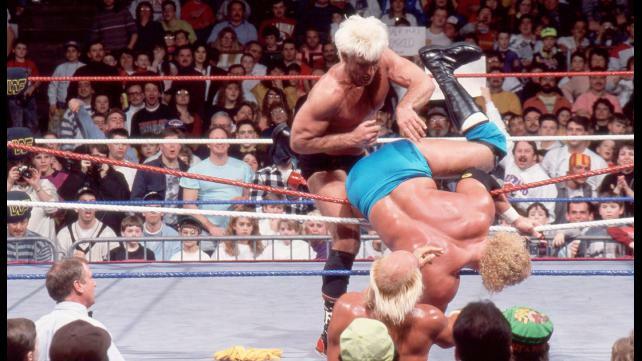 Most fans knew Flair's career was going to end that night, but we didn't know how. Those final moments of the match reminded me of being at a party and things start winding down and the good time is about to come to an end. When Shawn mouthed "I'm sorry, I love you" and superkicked Natch the reality set in. Three seconds later the career of the greatest of all-time had come to a screeching halt. The celebration that followed the next night on Raw is one of my fondest memories of a show. (We were there for that too). I've been bias to Flair's WWE stints, so my final pick is from WCW. 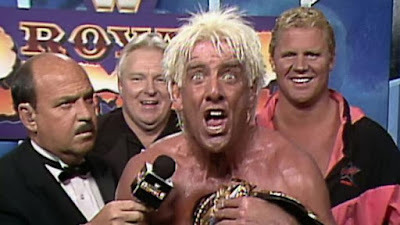 Flair was already NWA champion when I started watching, so I'm going with his feud with Ricky "The Dragon" Steamboat in 1989 for the world heavyweight title. Steamboat won the gold in a classic and the two battled it out several times in the months that followed, including the two-out-three match from Clash of the Champions. Flair eventually regained the title and immediately started a feud with Terry Funk and turned face in the process. Obviously these moments are the tip of the iceberg for the amazing career Flair had. Dusty Rhodes, Sting, Hulk Hogan and Von Erichs are just a few of the other favorite opponents he's had. I could go on for days, but I won't. What are your favorite Flair moments/matches?